Beautiful villa on one level, comfortable and pleasant, situated on the hill facing the sea, in a quiet residential area. Large living cathedral, with exposed beams and mezzanine, south, opening onto a covered terrace equipped with a large garden and a barbecue. The beaches are easily accessible by pedestrian (beaches of the Casino and the Residence at 600 m), shops and all amenities are located about 10 minutes walk (free minibus service). You will love the charm of the villa and the quiet location, you will enjoy the beauty of Bandol, its mild climate, its guaranteed blue skies and turquoise water. Under the plane trees and palms on the seafront you will find a picturesque Provencal market everyday, permanent summer events. Many tourist excursions await you. Suitable for 2 families (many beds). Tourism: Authentic Provence, that of Marcel Pagnol, invites two steps in the hinterland. Saint Tropez is 1 hour drive, Aix en Provence 40 minutes, 30 minutes Hyères, Marseille 30 minutes, Toulon 10 minutes. Pier for wonderful walks along the coast (Calanques de Cassis and Marseille) and to the islands (Bendor, Embiez, Porquerolles, Levant ...). In Bandol delightful organized walking tour of about 2 km, along the harbor and beaches. In the immediate vicinity you will find: the areas of the famous vineyards of Bandol, on the beautiful golf Frigate, Aqualand, beautiful hilltop villages (Le Castellet, La Cadiere d'Azur, Evenos ...). Nearby: Toulon harbor, the new racing circuit of Le Castellet, the beautiful mountains of the Ste Victoire and Ste Baume, Cassis Creeks, the golden islands (Port Cros, Porquerolles, ...). 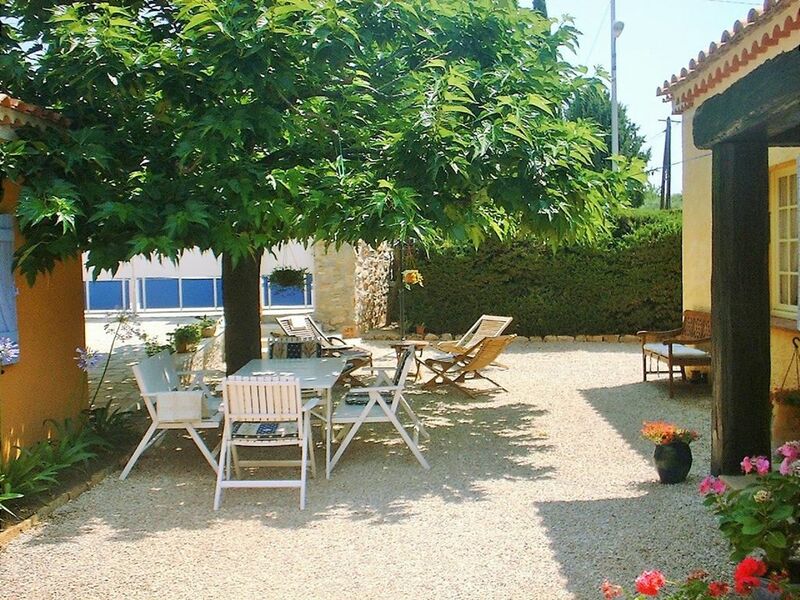 Housing: in a Provencal style villa, it is functional and very well equipped. There has been significant recent renovations. It is widely open on the shady garden, the natural atmosphere is particularly soothing. The flower garden is well maintained. Privacy is guaranteed by a plant closing. The area: it is quiet and composed of individual villas surrounded by parks and gardens. It is situated on the hill facing south, sunshine is generous. The sea is 450 m in direct line, easily accessible by footpath or by car (large parking lots near the beaches). Ottima soluzione! La casa è molto bella e attrezzata benissimo. Il giardino è splendidamente tenuto ed molto comodo e fruibile. I proprietari molto cortesi e disponibili! Nous vous acceuillerons avec plaisir si vous decidez de revenir. la maison sera encore plus agreable car nous ne cessons pas d'ameliorer son confort. Une très belle villa !! Nos vacances de juillet 2011 ont été merveilleuses. Bandol, le soleil et cette villa !! Les photos nous ont séduites et la réalité encore plus. Cette villa, à l'abri des regards, offre tout ce que nous voulions. Tranquillité, équipements de qualité, espace et proche de la plage. De plus, les propriétaires sont très sympathiques. exit autoroutiere and SNCF station on the commune of Bandol. Nearby airports: Marseille, Hyeres Toulon. The town of Bandol, renowned seaside resort is framed by those of St Cyr s / mer, Castellet and Sanary s / sea. It is also close to Toulon the sunniest city in France.